Liam is a brilliant architect living in New York. On paper, he has everything, but deep down, Liam feels empty. Fifteen years ago, he made the worst mistake of his life, he lost the love of his life, his only true love, Ben, and now he realizes something is missing in his life…or someone! Ben is a teacher in his hometown. Between his job, his best friend Seth, and his uncle Calvin, Ben has a quiet life. But Ben is lonely too. Since Liam broke Ben’s heart fifteen years ago, he refuses to be hurt again and choose to live his life safely…too safely. 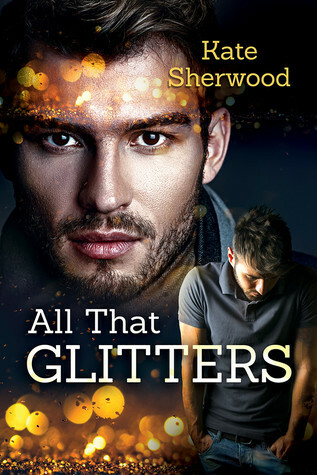 All the Glitters is a good contemporary romance full of feelings, angsts and of course love. This book is about Liam and Ben’s second chance. Fifteen years after leaving his town, Liam comes back without really knowing why. He’s in an almost mid-life crisis and trying to understand what’s missing. When he sees his ex, Ben, Liam realized that Ben was the missing piece, but he’s scared of being rejected after all these years. I liked Liam, and it’s something very weird coming from me since I hate cheaters and Liam is clearly one. But here, I didn’t see a dumb kid who messed up badly, I saw a man, mature, lonely and unhappy. I saw a man who really wants a second chance, who takes responsibility for his actions. I liked Liam, a lot. Ben is calm, sweet and mature. Except in the presence of Liam, then he’s alive and full of passion. I liked Ben a lot, and I understood him. I understood his fear and why he wanted to be safe with his heart. But sometimes, I wanted to slap him… Yeah, yeah, I know he’s the one who’d been cheated on, and he had all the rights in the world to be pissed, but sometimes he was too stuck in the past and a little bit unfair with Liam, but I understood him and couldn’t blame him for too long. I liked this book because the author didn’t write a Manichean story with Liam as the bad guy and Ben as the good guy. It was more than that, nothing was black or white, and there was a lot of other colors just like in real life. I loved it here. The secondary characters were good, and Uncle Calvin is definitely my favorite, this guy is crazy. The only thing that bothered me is that that sometimes, in my opinion, it was a little bit repetitive, and I had the feeling that I was turning in a circle in my read sometimes. But all in all, it was a pleasurable book, and I had a good time with Ben and Liam.